Know someone who will play 5 rounds of golf between now and April 15? Treat them with a Value Season 5 round Game Pack for $135! Click HERE for more information. Fill their stockings will all the essentials such as ball markers, hats, towels, and more! All accessories are now 25% off in the Arbutus Ridge golf shop. Know someone who's golf bag is looking a little tired? Visit the golf shop and save $20 on all golf bags. What's better than starting the year with some fresh clubs in the bag?! All TaylorMade M2 equipment is now for sale. Give the gift of better golf! The GBC Golf Academy at Arbutus Ridge offers a variety of packages and programs to meet your need, regardless of skill level, schedule, budget, or age! Click HERE to view all lesson programs and packages. Can't decide what to get the golfer that has everything? You don't have to! GolfBC Gift Cards are valid at all GolfBC courses in BC and can be used on everything from green fees and merchandise, to instruction and dinner! Click HERE to purchase a gift card or virtual gift card online. Keep the all weather golfer warm and dry with with new rain gear. All rain jackets and pants are now 25% off. Enjoy FREE personalization on any Titleist golf ball until December 31. Whether it's a name, nickname, or a clever saying is up to you! The golf gift that gives all year long! 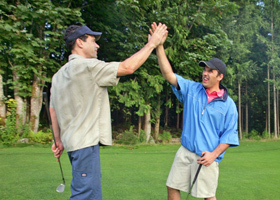 The NGCOA Red Book offers savings at over 110 golf courses in British Columbia. Make the game a little easier with any Garmin GPS device, currently on sale in the golf shop.